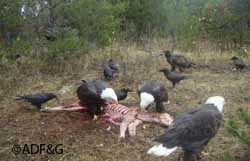 A trail camera image of eagles and ravens scavenging. Fish and Game invites the public to submit images for display in our online trail camera gallery. The gallery offers a way to share images, and photographers retain all rights to their pictures. We can watermark the image with a copyright symbol and the photographer’s name. 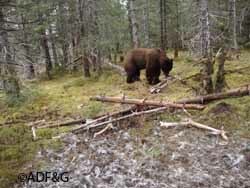 People like photo captions, so we’d like to provide good information: general area, what’s been captured in the image, photographers name, type of camera used and any comments on the image – for example, “the camera was set up on a moose carcass,” or “tracks indicated bears were frequenting this trail,” or for researchers, what kind of project is being conducted. 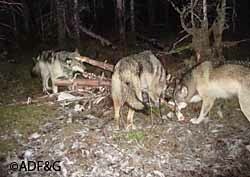 A trail camera image of a wolf pack at the remains of a moose carcass near Gustavus. The image has been cropped slightly, the bear image below is full frame. A brown bear at the same site. Send images and information to Riley Woodford at riley.woodford@alaska.gov. For questions, e-mail or call 907-465-4256.